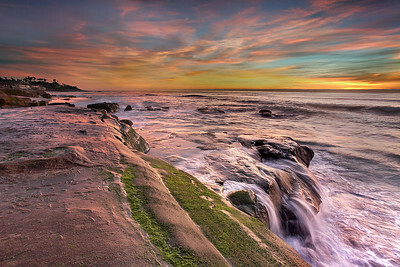 The San Diego area coastline is populated along nearly it's entire stretch, but the sandstone cliffs and bluffs along the sea are extremely beautiful in shape, color and form. And they look different depending on tidal and lighting conditions. It is easy to exclude most buildings and even people, which creates a sense of unspoiled nature and how it must have been here before humanity made this place home. A lone surfer waits for a wave a people stroll the pier watching a brilliant sunset at the end of a winter day. 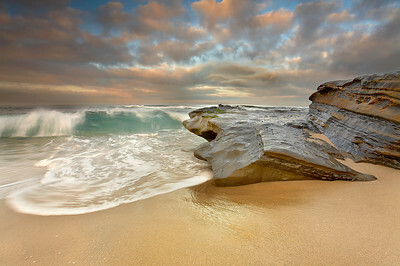 I tried to capture the texture of the sand and the patterns of the surf and foam to set the mood. 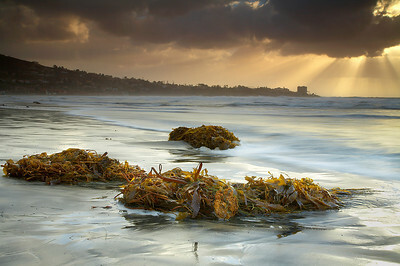 A winter storm clears from the west as the sun rises in the east on a beautiful and fresh morning in Ja Jolla. I waited for that small moment when the water makes the sand look like glass before making this exposure. On this morning, I was struck by how the clouds complemented the sandstone formations. 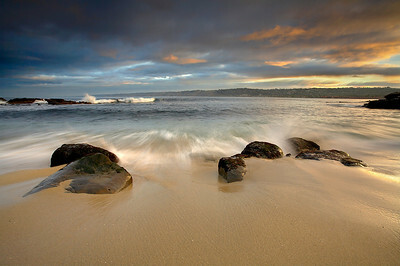 So I arranged this scene and waited for a dramatic wave to impact the shoreline. After I knew that I had captured this scene well, I went hunting for more. 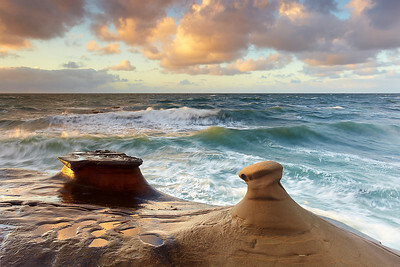 Since rock and sand are such important elements in the seascape, choosing a memorable vantage point can be crucial to the creation of a good photograph. I spotted the amazing cloud formation first, and then I looked around and found a spot where the sandstone formations lined up with the cloud patterns. I had to run quite a way down the beach to get here just in case the alignment were to disappear. Then I waited for a wave to complement the scene and provide definition to the sandstone formation on the right side of the frame. I have never seen anything like this before or after, so I was quite fortunate! 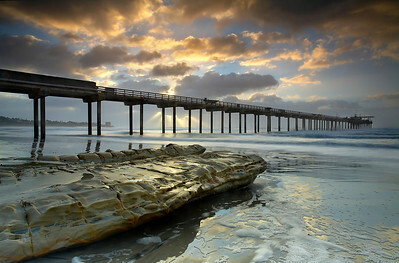 The Scripps Pier in La Jolla, California is used by oceanographers to do studies on the ocean and its effects on the rest of the planet. 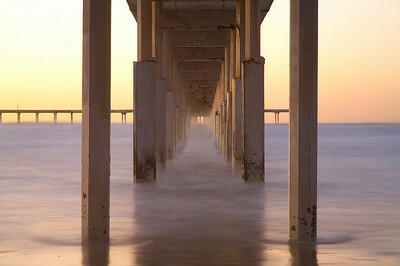 Before making this image, I waited for the light rays to arrange themselves between the pilings. I also waited for the waves to pull back leaving foam on the sand. I didn’t have to wait too long because the wind was howling and the clouds were moving quickly. The sea spray and rain made the shafts of light easily visible. The rain also added depth to the image by having the background disappear into the mist. I liked how the light brought out the colors in the foam on the sand. Good atmosphere often produces subtle effects that you don’t see on a clear day. 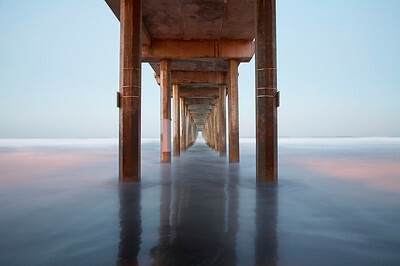 At sunrise, the first rays of light around the Scripps Pier had just touched the ocean creating this unusual effect that was enhanced by a long exposure time. The waves were large, so I had to wait for a pullback in the water in order to show the glossy nature of the still wet sand. Timing is everything, even on a 30 second exposure. This is not a symmetrical and straight pier, so I made sure that I was centered in between the average lines made by the pilings and let the asymmetric elements stand out as they are. The lights on the pier can still be seen in the water and the sunlight had just come into balance with the pier lights. 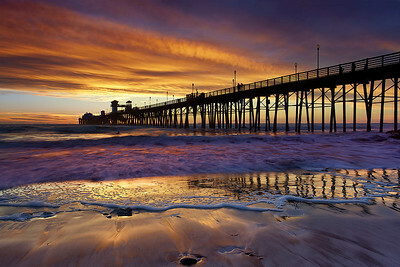 The Ocean Beach Pier, just north of San Diego is very long. It splits off and goes in two directions at the end. A low spot in the middle allows walkers to get very close to the surf during stormy periods. Often, the surf goes over the middle section, leaving viewers at the end high and dry to watch the drama from a close distance. 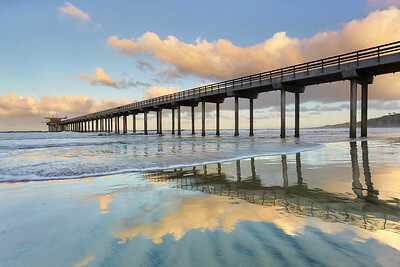 It's the longest concrete pier on the West Coast measuring 1,971 feet long. The sea can create some truly amazing structures. Here in the sandstone, a giant heart-like formation has been worked into the stone by the relentless action of the pounding waves. This is a very wide-angle shot of the sandstone heart taken from just about 15 feet away at a wide angle (17mm) just after sunset. I used a long exposure to smooth the water around the heart and brighten the image a bit. Only at high tide is the heart shape evident. Large breakers washed over this 15-foot tall cliff on the edge of La Jolla's north shore near The Cove. I waited for the right wave in order to show the forces at work that carved the unusual rock formations in the area. Only during high tide at sunset is this possible because this area is dry at low tide. 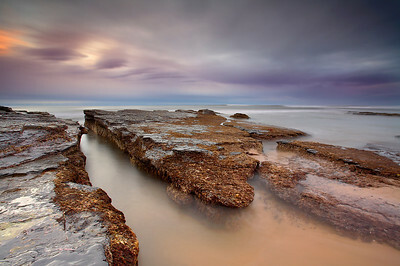 A low warm light allowed just enough contrast and exposure time to show the water eroding the sandstone. This old sandstone reef is just offshore from Point Loma, near San Diego. It is a great place for tide pools, but few people visit this location. 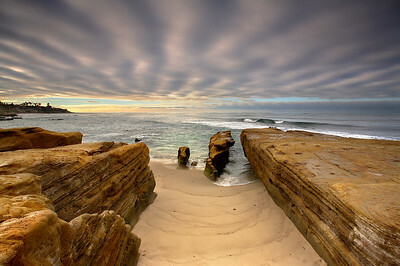 Most beach goers seem to prefer the endless stretches of wide sandy beaches in the San Diego area. But I like the more scenic and visually interesting spots along the coast, even if they are more difficult to reach at times. Long exposures work well here. They can emphasize the eroded structures while lessening the distraction of the waves, which would occasionally overwhelm the reef. The clouds also moved quite a bit during the 15 seconds of exposure, which added to the surreal look of this scene. 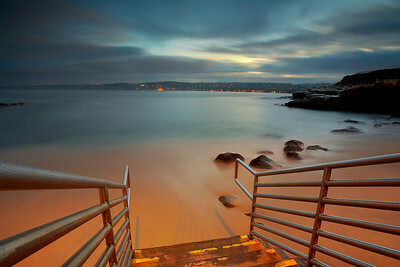 A long exposure before sunrise brought out the joy of first light on La Jolla Cove just after a winter storm had passed through. Other images I made just after this show a different side of this place! 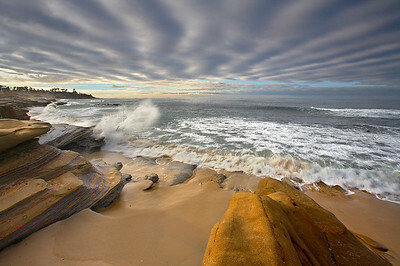 A storm brought some rapidly moving waves to La Jolla cove at sunrise. It was a morning of shooting and running! I wanted to get in close to show the drama of the incoming surf. The sky lit up quite well and some low warm light made it to the beach. It took about 10 minutes to get this shot right because the wave cycles were too rapid for me to get the tripod properly set up in between waves, but finally things worked out. Soon afterwards, the light became too bright and the good light was gone for the day. An intense winter storm blew into the San Diego area with 30-50 mph winds and lightning. But it also brought dramatic light and large waves. I had to shelter the camera with my body in order to get this image sharp. I will never forget being out there on this day! I got drenched several times trying to get close enough to the post-storm surf to get a good view of the flowing water. The sandstone rock dropped off right behind me, leaving no place to run from the waves. Sometimes incoming water looks the best in a photo, but here the water draining off the rock face looked the best. Every situation is different. The sunset was so intense that I had to desaturate this image 10% to retain detail in the sky. Everything was bathed in reds and pinks. 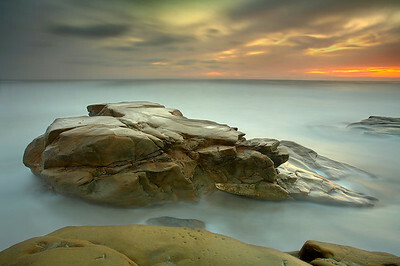 Large waves are constantly trying to undermine this slab of La Jolla sandstone and my tripod! The sandstone definitely outlasted my tripod! 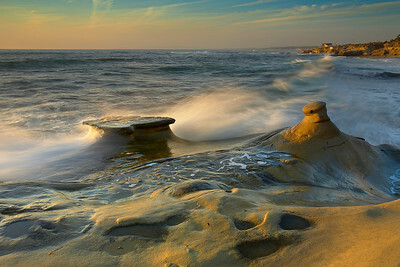 The wide variety of sandstone formations along the La Jolla shoreline could keep a photographer busy for a very long time.